"A couple of loopy folkies bayin' at the moon in a convincingly au naturel manner." 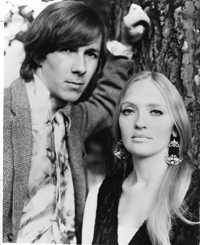 Allan Fraser and Daisy DeBolt met at a workshop at the 1968 Mariposa Folk Festival. Their first words to each other were "I like your voice." As Daisy puts it, Allan "knocked on the door and that was it, he never left." Not long after, their budding musical romance found them hitchiking every day from Toronto to Hamilton, Ontario to work on material. The young singer/songwriters were creating a unique sound all their own and were eager to perform in front of a live audience for the first time. By the summer of 1969 Fraser & DeBolt was officially formed as a duo and Allan and Daisy were playing Mariposa to standing ovations in teeming rain. The audience was spellbound by the new direction in music they had created. Early winter 1970 saw them in the United States on a coffee house circuit tour. During the second week of February, while in upper New York State, they received a message from Ravi Shankar's manager, Jay K. Hoffman. Hoffman's secretary had heard the twosome at the Bitter End in New York City and strongly suggested to the impresario that he sign them to a management contract. Jay Hoffman did just that and quickly arranged for Fraser & DeBolt to audition for a record deal. On April 5th they opened for Tom Paxton at the legendary Fillmore East in New York City with major label executives seated in the front row. The showcase led to two offers. One was from the small Stormy Forest label owned by Richie Havens. But, the duo opted instead for a contract offered by Bob Devere at giant Columbia Records. Work soon began in Toronto on their first album. They were accompanied by violinist Ian Guenther with production by Craig Allen, who was also the art director for the album cover. On its release in January, 1971, one critic wrote it had "moments when the only possible responses are to laugh aloud or to cry, and there are very few aesthetic experiences that genuinely produce those effects." Rave reviews appeared in The New York Times, Maclean's, The Los Angeles Free Press and many other publications. With so much momentum building, Allan and Daisy went back into the studio in the fall of 1971 to record their second album With Pleasure featuring musicians from the Canadian band Simon Caine. The duo continued to tour and perform across Canada and the United States and in 1974 they represented North America at the International Song Festival held at Sopot, Poland. The festival was founded by Wladyslaw Szpilman who years later was the subject of the acclaimed film The Pianist. Fraser & DeBolt broke up not long after, except for a few reunion appearances. While they never made it to the big time like the critics predicted, in the hearts and minds of their fans they are legendary and unforgettable. Painter and musician Mendelson Joe speaks for many fans when he says, "Fraser & DeBolt were magnificent." In November of 1994 their story was told in an episode of Adrienne Clarkson Presents on CBC-TV. As recently as January, 2004 their first album was still on the playlists at radio station WFMU in Jersey City, New Jersey beaming their "far out folk" into the urban jungle of New York City where they were first discovered. Perhaps the Canadian music trade paper The Record explained the duo's significance in pop music history best when it wrote, "Fraser & DeBolt were the greatest Canadian band never to have made it."